According to WordPress, a lot of people have been searching for some variation of the title of this post and end up coming to my blog. While a lot of them stay around and click a few things (and you guys are most welcome!) I don’t think that they’re finding what they’re looking for because none of my posts to date have actually spelled out my process for digital negatives. I think it’s time to delve into the technical details and explain exactly how I’ve gotten to this point. To start, I should emphasize that when I say “digital negative,” I don’t mean a digital image as opposed to a film image. Well, I do, sort of, but what I’m really talking about is an OHP (overhead transparency) printed on an inkjet printer. In fact, I don’t use film at all in my process. All of my images are taken with a digital camera, minimally processed in an editing program for basic darkroom edits, and then printed as a negative for cyanotype. I use the simplest process for digital negatives – I’ve heard it called the RNP process in alt forums, as opposed to the Quad tone process or Precision Digital Negative process. For those with a lot of money and a nice Epson printer, the Quad tone is probably a better bet because you can precisely regulate the amount of ink (density) that goes on your negative. I, however, have a simple HP all-in-one printer. Nothing fancy. What that means is that I regulate density by picking the most effective UV blocking color for my printer and applying a harsh correctional curve to my images. Once I picked out a good color after cyanotype printing the HSL color array, I began the exhausting process of fine-tuning it. 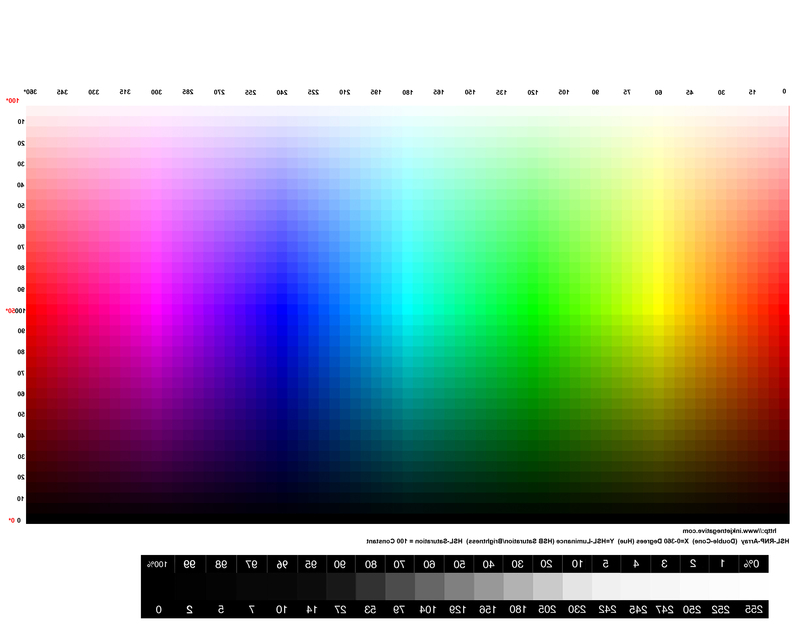 Since my version of Photoshop is so old that it can’t support the handy little Chartthrob script, I had to manually craft a step chart of gradients from 0% to 100% – the tonal range of an image. My first step chart was woefully off – I had far too much pure white showing and not enough midtones and shadows. So, I tweaked it, gradually moving up the HSL color line I had chosen until I got a really good range of tones. That meant that I was awash in identical cyanotype gradient charts for days – it’s a really good idea to label each one or you’ll go crazy. Once I had the perfect color, I began to extrapolate the information on the step chart to craft my own destructive curve. Because I use a slightly different process than most people who I’ve “met” on the internet (double coat of emulsion, sized with arrowroot sizing) my process was not only more contrasty than normal, but requires a dense negative. (in a later workshop a student used an ortho film negative with my process with no problems. That’s not normal.) Making my own curve instead of relying on the basic cyanotype curve from the Alternative Photography website allowed me to customize my negative to my process. Basically, if the chart said that 58% of the color really printed out in cyanotype as 35%, the curve would adjust for that and allow all the tones to print. It’s that simple. Once I had the right curve and color, setting up my negatives is a really simple process. Get the original image perfect. Set it up as Black and White, but not Monochrome. Apply the saved curve. Ignore how it looks – it’s appalling. Apply the color by using the Edit>Fill>Screen option. I don’t just print on any overhead transparency though, I use Arista II, the Freestyle photo version of Pictorio, the brand a lot of the big guys in the hybrid alt community use. I’ve tried Pictorio, but Arista works just as well for me and is a little cheaper. Both types have a special coating on one side that holds the ink instead of letting it slither all over the place. I store all of my negatives in acid-free sleeve protectors, and so far, I’ve used them multiple times with no issues. Who knows how long they’ll last, but if something drastic happens I can always print another negative. It’s cheaper and easier than working with Ortho-film in a darkroom – which I have done, and hated. This entry was posted in Cyanotype and tagged Alternative Process, Art, Cyanotype, cyanotypes, fine art, photography. Bookmark the permalink. I’m glad I could help! Best of luck, and feel free to email/comment with any questions. I have to echo what Paul said. Thank you so much!!!!!!! You have just opened a very large door. i’ve recently become interested in cyanotypes and have made quite a few using plants and objects and was looking to make cyanotypes of my photographs. your post is perfect. can i print negatives on a laser printer? what transparency film would i need for that? I doubt a laser printer would work because of the heat – it would probably warp the film. From what I’ve seen of laser printers the ink coverage won’t make a very good negative either. Best of luck! FWIW, many types of transparencies can be printed on with a laser printer. Yes, they can be printed on, but will they make a decent negative? Given the nature of laser printers I don’t think so, but again, I’ve never tried it! Do you have any idea where I can download the HSL Array file… it seems Michael Koch-Schulte’s website (www.inkjetnegative.com) is no longer available? Hi Mark, thanks for letting me know! I removed the dead links and put a JPG version of the HSL array in instead. Please click the link in the Digital How To post to download. I’ll try to post better directions, but essentially pick the most accurate tonal range, chose the square that’s not quite white, and then go one square up to choose your color. Thank you for all the cyanotype articles, and for providing a copy of the HSL array.